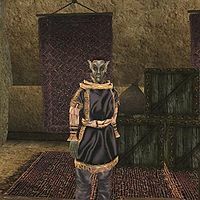 Balen Andrano is a Dunmer trader who buys and sells all manner of goods from his shop in the western corridor of the Waistworks in Vivec's Redoran Canton. Balen has an empty grand soul gem for sale and a few exquisite items of clothing. He's had a run of bad luck lately, due to the competition from Jeanne's shop in the Foreign Quarter. He wears an extravagant shirt, with matched pants, shoes, a belt, a ring, and a sleep amulet. Of his wares, he carries a silver shortsword, a steel spear, a steel halberd, a silver spear, an long iron spear, a regular iron spear, an iron halberd, and a chitin spear. The Dwemer's Bone: Help Balen Andrano's failing business by sabotaging his competitor, Jeanne. "How may this poor trader help you today? My prices are reasonable, as I've recently had a run of bad luck." "That's me. What do you need?" "It's just been a really slow time for me, and we're not getting shipments in as regularly as we used to. So, the prices for us have gotten really high. Then there's that Jeanne over in the foreign quarter. She's always got the merchandise, so she's always got customers. I'd really like to change her luck." "Well, I think I may have a way, if you're interested in helping. I recently came across an object; some say it has some magical properties. It's a bone from some long-dead dwarf. If you can place it in a certain place in Jeanne's shop, it should bring her nothing but misery." I can help you. : "I appreciate your help. The bone must be placed in a chest near where she sleeps. Then, while she rests, the bone should work its magic and bring her some trouble. Maybe then I'll start getting some business." I'm sorry. I cannot help. : "Well, if it weren't for my bad luck, I wouldn't have any luck at all. Perhaps someone else will take up this task for me." "I've got to do something. Her success is killing my business." "You've done it? Excellent! I'm sure to get more business now. Thank you, friend. Here's your payment, as promised. It will allow others to sleep soundly, when it suits you." "They caught you? This is terrible! Well, at least they don't know I was involved." "She's got a shop over in the Foreign Quarter. Been taking a lot of my business." "Nalvilie? Yes, I knew her. I knew her quite well, in fact. I haven't seen her in years." This page was last modified on 17 March 2017, at 15:15.